is a lecturer in psychology at Goldsmiths, University of London. He investigates how babies learn about the world and how our brains experience time. He is the author of Help Yourself (2013), a novel with free answers to the meaning of life. Laughter and smiles transcend barriers of age, language and culture, and babies know this better than anyone. They don’t speak our language. They don’t share our culture; and they are at least a generation younger than us. All the same, we can easily share a laugh. Spend any time with a baby and, assuming that they’re fed, clean and warm, they will put most of their effort into stealing your heart. Babies are gleeful, cheerful, charismatic and gregarious – inherent comedic qualities that ensure babies give cats a good run for their money in funny YouTube videos. Yet, while research in cognitive science has long recognised the importance of cuteness in early bonding, very few researchers have dug deeper. Until now. With a renaissance in what I like to call ‘positive psychology for babies’, we are starting to appreciate that smiling and laughter serve an important purpose from birth. Anecdotal reports of babies pictured smiling in ultrasounds have been around since 2000, when the resolution of scans became good enough to show facial expressions. Looking at this evidence systematically, the psychologist Nadja Reissland at the University of Durham has identified seven foetal facial expressions and confirmed that both crying and laughing are ‘practiced’ in the womb. This corroborates findings from my own global study of baby laughter, based on video evidence sent in by parents who report smiling in the first month or two of life – with laughter just a few months behind. It is a total myth that early smiles are trapped wind: rather, they express genuine pleasure. If early laughter is quiet, breathy and gentle, it’s because very young babies lack the muscular control to produce fully formed laughter. But since parents know their own children better than anyone, when they report genuine smiles in the first weeks we choose to believe them. The survey also showed that peekaboo is the most popular way to make babies laugh the world over. It works throughout the first years of life, although the sophistication of the game can change. In the first six months, babies are genuinely surprised by your return; then they learn to anticipate it and are pleased that their predictions come true. By the time they’re toddlers, they’re often playing to humour you. Throughout this period the basic elements of the game remain the same. It is all about eye contact – which is pure social interaction, stripped down to its barest elements. Are you attending to me? Really? You can’t play peekaboo while fiddling with your iPhone. There, that’s better: now look me in the eye. Peekaboo gives babies what they want more than anything: adult attention. It allows them to learn about the most confusing and compelling mystery in their world: other people. 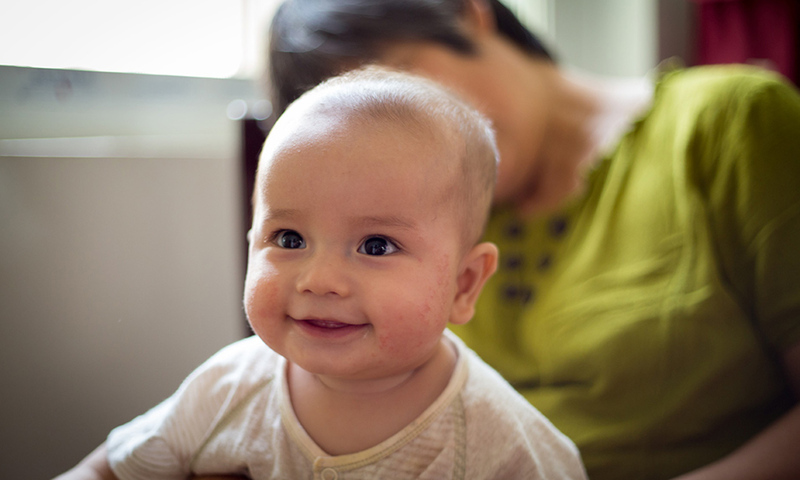 Peekaboo’s popularity emphasises what appears to be the two key features of baby laughter: its purpose is to facilitate learning, and it is intensely social. The psychologist Rana Esseily and her colleagues at the University of Paris found that babies learn better with a jokey (as opposed to serious) play partner. I suspect that the converse is also true, that mirthful babies encourage adults to teach them things they are interested in. It’s obvious, for example, that crying is a signal that babies want something to stop, and that they want you to stop it. What is less obvious is that baby laughter is the opposite: babies laugh when they want you to continue to interact with them. That way, they learn more. Critically, it seems as though infants can spot the difference between joking, pretending and being literal. Elena Hoicka, a psychologist at the University of Sheffield, has demonstrated that this ability emerges before children are two years old. In other work, Hoicka has traced the early production of humour, showing that infants copy parental ‘jokes’ by the time they’re one. At two, they invent their own. The psychologists Vasu Reddy at the University of Portsmouth and Gina Mireault at Johnson State College in Vermont have recently speculated that this transition to overt clowning is an important marker of the awareness of other minds. It also coincides with the inexhaustible energy of toddlerhood, which, for parents, can make the joke wear thin. Paradoxically, the best way to make a baby laugh is to take her seriously. After all, people make us laugh even when they don’t have anything funny to say. The psychologist Robert Provine at the University of Maryland in Baltimore has shown that the majority of laughter in everyday life is not associated with jokes but with social graces and group cohesion. Recent investigations in my own lab suggest that such behaviour starts early. We filmed toddlers as they watched a funny cartoon in groups, pairs or on their own, and found they laughed around five times as much if even just one other child was present. Even in infancy, it seems, a joke is best shared. Of course, we’ve known a lot of this for a long time. Charles Darwin and the eminent Victorian psychologist James Sully were both interested in the role of baby laughter for the evolution of human emotions. The difference is that, this time around, we are bringing babies into the laboratory. As an indication of just how seriously we take baby laughter, we’re now planning experiments to uncover how laughter changes the way babies pay attention to the world and their connections with the people around them. I feel very privileged that my job is to make babies laugh.